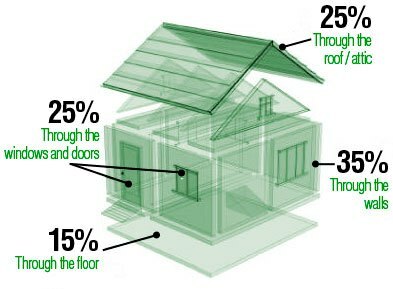 Poor attic insulation is responsible for 25% to 30% of heat loss. Air seal to upgrade your Attic! Generally the first place that comes to mind when you are considering adding insulation is the attic. Poor attic insulation is responsible for 25% to 30% of heat loss.This is why most attics are a great starting point for many homeowners due to the relatively easy access and very few obstructions. Sometimes adding more insulation is only part of the battle, there is still an opportunity to greatly improve your home’s energy efficiency through air sealing. Through the many leaks in an attic, air can leave the house or air can penetrate from outside and can account for a substantial amount of heat loss, as well as lead to various moisture and mold related problems. It is easy to see that Air Sealing is very important! Attics are a critical area to insulate while at the same time being prone to many problems. We can inspect your attic for things such as air leakage, excessive settling, adequate ventilation, moisture, proper draft stopping, unsafe insulation around heat sources and much more. If you do find problems we can recommend various solutions from insulation removal to draft stopping to improving air flow when needed or maybe just a simple top-up is needed depending on your requirements. In some cases you may not need anything and when that is the case we will simply inform you of the fact. A do it yourself-er often views insulation as a simple process of taking some itchy pink batts and popping them in the wall cavity or spreading around some loose fill in the attic. Unfortunately there is a lot more to the process of properly insulating a home. Building science technologies demonstrate the home works as a unified system requiring everything from the basement or crawlspace all the way up through the attic to maintain a consistent building envelope. It is this “home as a system” view that is the key to reducing your energy costs and improving the comfort of the home. It’s actually possible to lose over 80% of the effectiveness of insulation if all factors are not handled properly. Insulating an attic generally requires some type of air flow system to maintain a consistent roof temperature. This allows ventilation of heat accumulation and the maintenance of consistent temperatures on your roof. In most circumstances the temperature in your attic should be within about ten degrees of the outdoors. Excessive heat in the attic can reduce the life of your roof and definitely signifies a problem. Often times that problem is insulation, air seal or venting related. At Eco Insulation® we can inspect the attic for problems and recommend the solutions. One of the most important factors to consider when inspecting the attic insulation are bypasses. Bypasses are hidden air passageways that lead from the heated space into the attic. Because warm air rises, it continuously moves up the bypasses and escapes into the attic. Common attic bypasses are located around chimneys, ceiling light fixtures, heating ducts, kitchen and bath exhaust fans, plumbing, electrical wires, dropped ceilings and soffits. We inspect your attic for these bypasses and other issues. We then provide solutions to maintain a proper seal on your building envelope. This results in improved energy efficiency and comfort in your home. The attic hatch is a also major source of heat loss through air flow. In many cases the hatch cover is nothing more than a piece of plywood. The attic hatch should be treated as an exterior door – so it should be insulated with the same R value as the attic insulation. It also needs weatherstripping and caulking around the hatch trim. To hold the attic hatch cover tight against the weatherstripping install hook and eye bolts. Other elements that require special attention are combustible sources. Things like chimneys, non-IC fixtures, heated flue pipes and so on all require specific techniques to avoid potential fire hazards while also maintaining a consistent building envelope and air seal. Snow melting faster than your neighbours? do you get a lot of icicles forming? This is a good indicator that your attic has low levels of insulation, your heat and money are going straight out the roof. Read more on Ice Damming here.